This really helps with inflammation and reduces my aches and pains. I highly recommend this product. 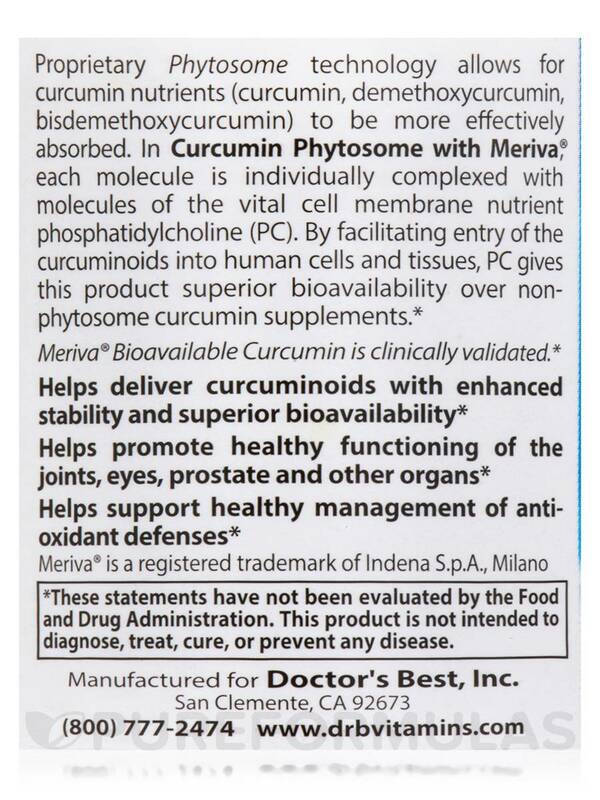 Curcumin Phytosome with Meriva by Doctor's Best proves to assist in overall immune response and health! Great potency and quality. My holistic practitioner has recommended taking turmeric every night for inflammation. You could decrease inflammatory compounds in your body with Curcumin Phytosome with Meriva® Veggie Caps from Doctor’s Best®. Inflammation could pronounce transform into serious health conditions in your body‚ which is why you need a supplement to regulate inflammatory markers. Meriva‚ or phytosome curcumin‚ may control inflammatory compounds so that they do not result in serious conditions. Curcumin is the yellow-orange pigment obtained from turmeric. Being a powerful antioxidant‚ it helps fight free radicals in the body and promotes a healthy inflammatory response. To promote better absorption of curcumin in the bloodstream‚ this compound combines with phytosomes‚ plant extracts that bind to phosphatidylcholine. Meriva is known to promote joint health‚ vision‚ circulation‚ and eye health. 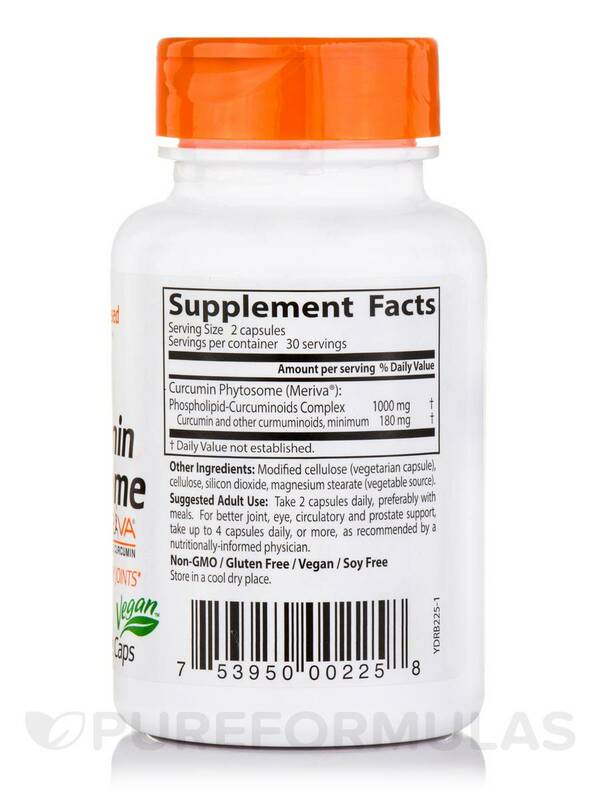 The phospholipid-curcuminoids complex in this supplement from Doctor’s Be9`1st® may assist curcuminoids reach healthy cells and tissues‚ thus improving the bioactivity of this supplement. Boost antioxidant activity and support the healthy function of vital organs and tissues of the body with Curcumin Phytosome with Meriva® Veggie Caps from Doctor’s Best®. Other Ingredients: Modified cellulose (vegetarian capsule)‚ cellulose‚ silicon dioxide‚ magnesium stearate (vegetable source). Non-GMO / Gluten-Free / Vegan / Vegetarian / Soy-Free. Take 2 capsules daily‚ preferably with meals. For better joint‚ eye‚ circulatory and prostate support‚ take up to 4 capsules daily‚ or more‚ as recommended by a nutritionally-informed physician. 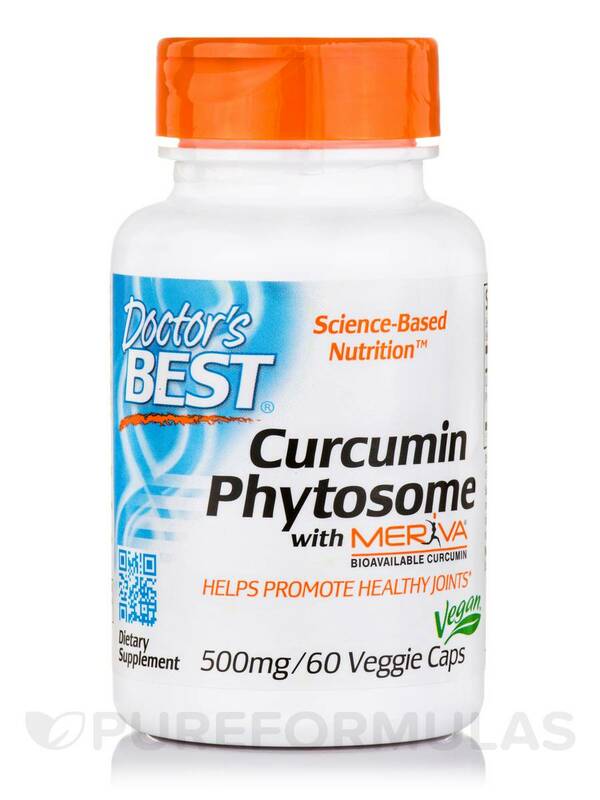 Curcumin Phytosome with Meriva 500 mg by Doctor's Best is a good product, helps with arthritis. My husband and I have been using Curcumin Phytosome with Meriva 500 mg by Doctor's Best to cut inflammation. My allergies have cleared up and my husband's joint pain disappears when he takes this faithfully. My husband cut a tendon and even though physical therapy and the surgeon have cleared him, He still dealt with pain and swelling daily. Curcumin has even taken that away. My husband couldn't play piano very long without being in pain. Recently, He was able to play for an hour at a retirement home. Easy to take with no stomach upset. These capsules are well made and easy on the stomach. I have just started taking Curcumin Phytosome with Meriva from Doctor's Best and am very happy with results. They definitely helps my joint pain! I have severe inflammation resulting from a car accident. I had taken other curcumin supplements in the past with little results. 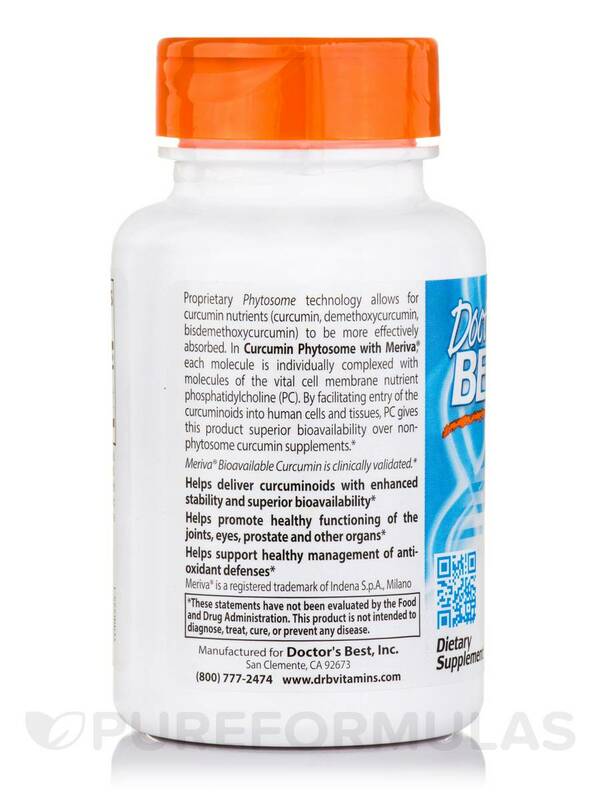 I tried Curcumin Phytosome by Doctor's Best hoping it would be more absorbable by my body. I have been taking this for about a week now and have had several good days. I will continue to take Curcumin Phytosome. I have to take several pills. At this time four members of the family are taking it. I read a booklet called Curcumin the 21st Century Cure by Jan McBarron, M.D.,N.D. and was excited about getting this supplement back on board again providing the price was right. Curcumin stains so if for any reason you need to open a capsule be careful. 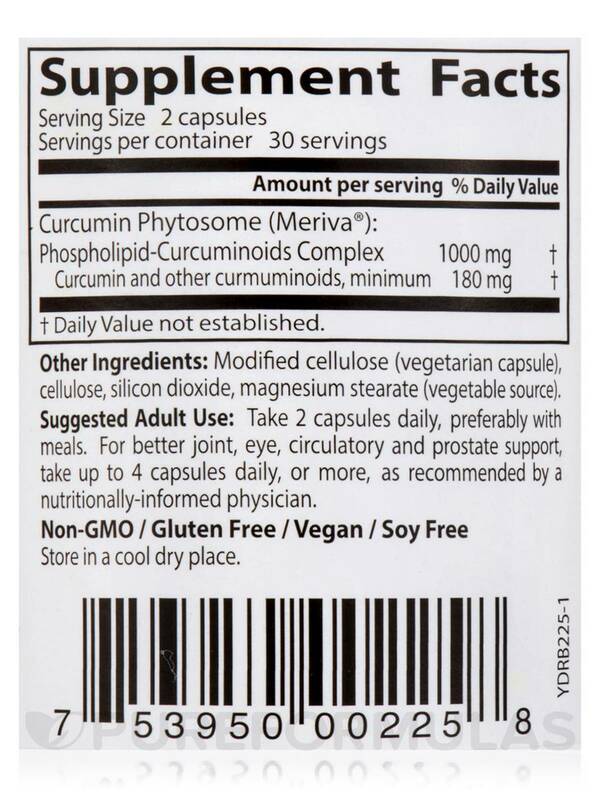 Ordered Curcumin Phytosome with Meriva by Doctors Best for husband for overall anti-inflammatory and some joint pain. He has been using for about a year now. He feels better when taking it and always lets me know when he is about out so I can order another bottle. Ive started taking Curcumin Phytosome with Meriva because of its anti-inflammatory effects also because eating raw turmeric stains your teeth! I was told Curcumin Phytosome with Meriva is good for keeping away colds too.